Mireille Delunsch sings Elettra with a bloody vengeance in the 61st Festival d'Aix-en-Provence Idomeneo. Mozart's opera seria is in a new production by Olivier Py, conducted by Marc Minkowski, and opens on July 4. Not gonna lie, we really liked Delunsch in Peter Mussbach's Traviata, her Violetta crafted as a tragic Marilyn Monroe doppelgänger in a neon-etched David Lynchian dystopia. 'Tho if memory serves well, it was marginally less bloody, and there was less ~socialite hair~. Bringing-out the fatwa: This will not end well. Hans Neuenfels' September, 2006 Berlin Deutsche Oper Idomeneo made international news, igniting the Islamific ire of several Muslim-rights groups and assorted threats, demanding Deutsche Oper to pull the plug on the entire production, which they eventually conceded to. 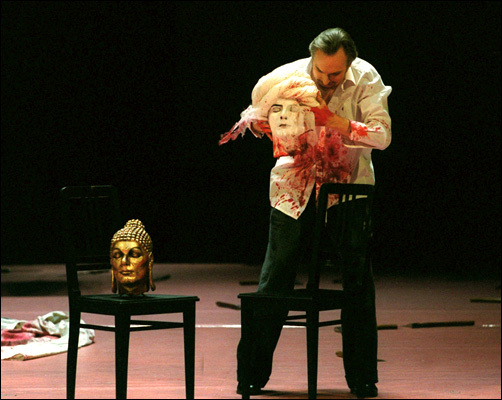 The cancellation was invoked by shouts of blasphemy; specifically a scene where Idomeneo displays Mohammed’s disembodied head (along with the severed heads of Neptune, Jesus, and Buddha). Finally, Idomeneo will make its return in a handful of days, opening at the Berlin Deutsche Oper this Monday, December 18, 2006. Spiegel has the article, along with a five-image photo gallery displaying the never-before-seen, newly-veiled DJ Mohammed chillaxing with the other super-deities. And here's something quite delightful: A small bit of mischief is circulating around the workshops within the Deutsche Oper House, as last week, “four scandal-ridden severed heads vanished without a trace…triggering an opera house-wide search for the missing heads.” If the severed heads don’t turn-up, replacement props will be made. O RLY? Take that, blasphemers!